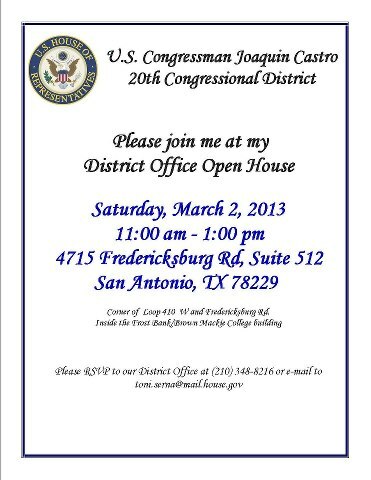 Lets show our support for Congressman Pete Gallego's this Saturday, by attending his San Antonio District office Grand Opening. The new district office is located at 1714 SW Military Drive, Ste. 110 and will run from 2-4 p.m.
Party honoring Former Congressman Charlie Gonzalez, Friday March 1st from 5:30-9:30 p.m. @ the home of Bob & JoAnn Comeaux, 702 West French Place. 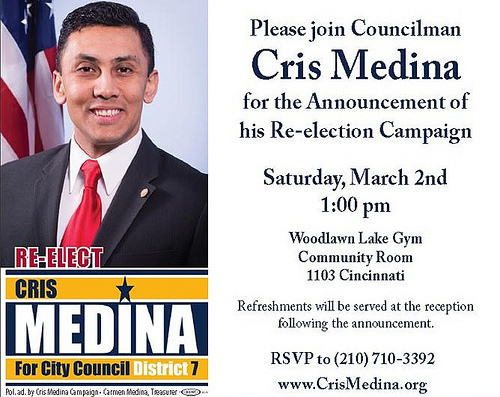 .Saturday, March 2nd at noon, Grady's BBQ, - 6510 San Pedro, Great Democrats together. about the success of the block walkers we hired. 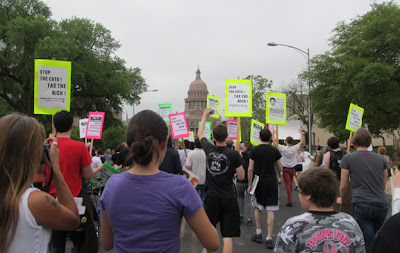 Democracy alwas means our participation. 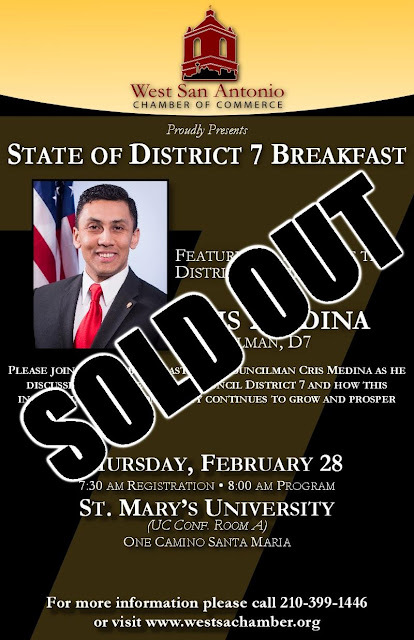 Thursday, February 28th- Run will begin at 7 a.m. and end at City Hall at approx. 8:45 a.m Councilman Rey Saldaña will run 7.5 miles to City Hall to file and begin his re-election campaign. The 7.5 miles represent the length of walking/jogging trails (4.2) and sidewalks (3.25) added to the district during his first term. The Fiesta Commission Charitable Corporation will select and crown Miss Fiesta San Antonio 2013. The evening will begin with a selection event during which the 5 finalists will present their service project they will execute during their reign to a panel of distinguished judges. 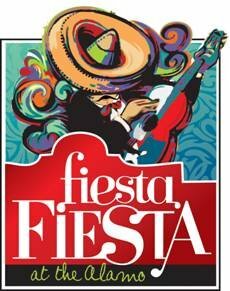 These young women can focus their service project on any of the Fiesta Commission Charitable Corporation’s initiatives which include: education, environment, safety, health & fitness, arts & culture, and history & heritage. Once selected Miss Fiesta 2013 will not only serve at the Fiesta Commission’s official ambassador, but she will use her title to implement her project and leave a lasting impact on San Antonio. On sunday, March 3, 2013, Polly Texas Pioneer Association will present the life and times of a legendary Tejano Pioneer; Jose Policarpio "Polly" Rodriguez. Noted Texas historian; Rudi R. Rodriguez will present the life of this significant figure in the development of Texas. Rodriguez has authored "A Tejano Son of Texas", an autobiography on J.P. "Polly" Rodriguez. From boyhood, 'Polly' followed a lifepath that would make him indispensible in forging the roads and establishing towns and governments in Texas. Please join us on March 3rd, 2013 at 6 p.m. at La Trinidad, located at 233 N. Pecos in San Antonio, Texas. Following the presentation, the author wil be present for book signing. Light refreshments will be served immediately after the presentation. This event is free and open to the public. 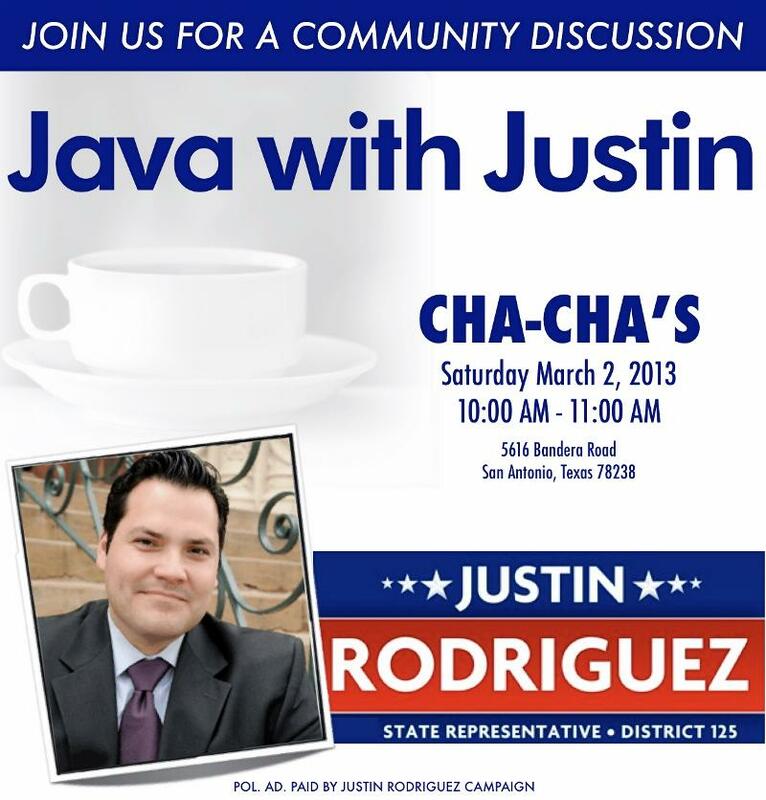 Please RSVP to attend this event no later than March 1st at 5:00pm by calling Lynette Gonzalez at (210) 673-3584. 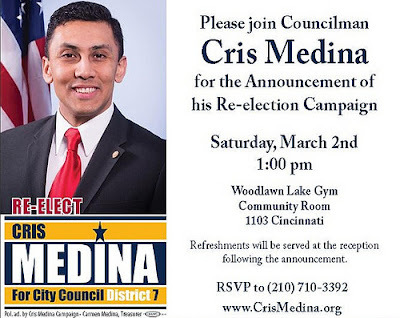 If you have any questions, please contact us at (210) 673-3584. Tickets are selling fast. 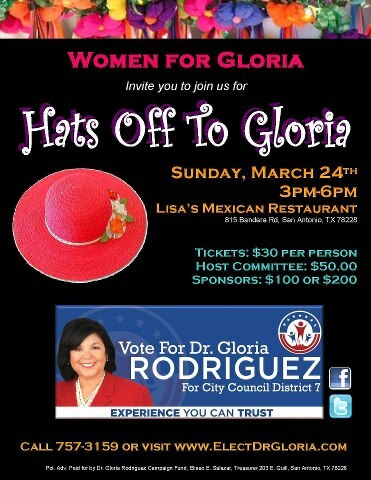 Make your reservation to my City Council race for District 7 Fund Raiser on the Event Page or let me know on FB. If you want to attend, there are different sponsor levels and/or the tickets are $30. It was so much fun last time. Hope to see you there. Send your money to: Gloria Rodriguez Campaign Fund, In care of Eliseo Salazar, Treasurer, 203 E. Quill, San Antonio, Texas 78228. T Decorate your hat.....it will be judged for: Elegant, Funny, Over the Top and Fiesta." Winners will get a prize. See you there, and start working on your hat. Thank you. 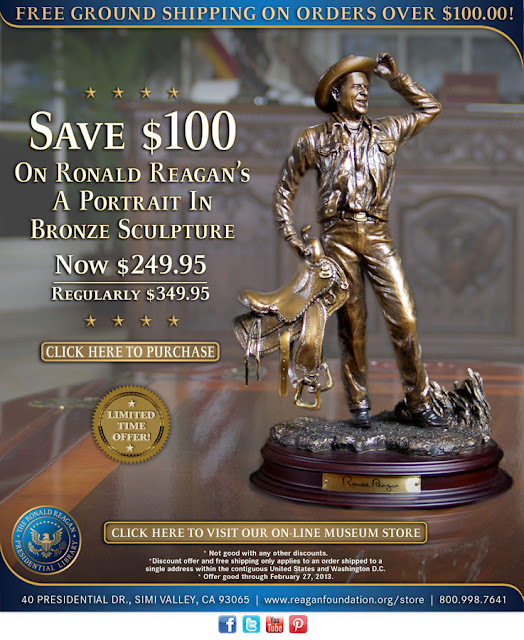 President Ronald Reagan's "A Portrait in Bronze Sculpture"
I remember it as if it were yesterday, although it occurred nearly 12 years ago in 2001. That series of coordinated suicide attacks upon the World Trade Center in New York and in Washington D. C. shocked the world. For many older Americans who lived through the bombing of Pearl Harbor in 1941 that started World War II, it was like a flashback. President Franklin Roosevelt referenced the attack on Pearl Harbor in 1941 as a “Day that will live in Infamy!” That day in 2001 will also live in infamy to the younger generation. .I was a Special Education teacher in a 7th Grade English class at Kingsborough Middle School in Harlandale ISD with the mainstream teacher presenting the lesson at the time. I was sitting in the back of the class monitoring the special needs students and looking up some test material on the computer when I noticed on the computer screen the photos of the two towers after they were hit by the planes. Before I could say a word, another teacher opened the door and rushed in and informed the class that it was reported that there was a tragic accident in New York. Initially we were not aware it was a terrorist attack. Throughout the day reports filtered in as everyone reacted in shock and dismay. One of my fellow teachers was visibly shaking because she informed us during our conference period that her dad was scheduled to visit the Pentagon that day as part of his work. By the end of the day she learned that her father had gone to the Pentagon and the area he was to visit was the area that took a direct hit from an incoming plane hijacked by the terrorists. By the grace of God, my fellow teacher’s father had miraculously left the area less than five minutes earlier to meet someone for coffee. He was OK! Army Lt. Colonel Karen Wagner, a Judson ISD graduate whose office was in that same area did not survive. Wagner High School is named after her. Another faculty member’s aunt was at the World Trade Center when a huge slab of concrete fell from the side of the building and landed some feet away from where she was standing. The impact was so great that the back blast threw her nearly one hundred feet away, dislocating her shoulder and breaking her arm. She was unconscious for 24 hours but woke up wondering what had happened to her. My own younger brother, Kelly, I learned the next day, was scheduled for one of those flights from Boston but inexplicitly cancelled at the last moment and rebooked another flight for later that day. He too is alive to tell the tale by the grace of God! The terrorist attack that day still affects us, and our lived ones, be it a friend, family member or humanity in general. We must never forget and honor those who lost their lives. We salute those who perished and those who survived to tell their story. 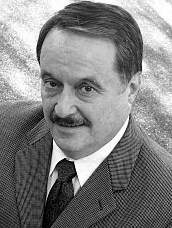 Steve Walker is a Vietnam Veteran, former Journalist and Justice of the Peace. His former La Prensa column, “Ask the Judge,” ran for two years. Please join me at the courtyard from the First National Bank Building at 1800 W. Commerce, on Wednesday February 27th at 5 p.m. to 7 p.m. for my first fundraiser. 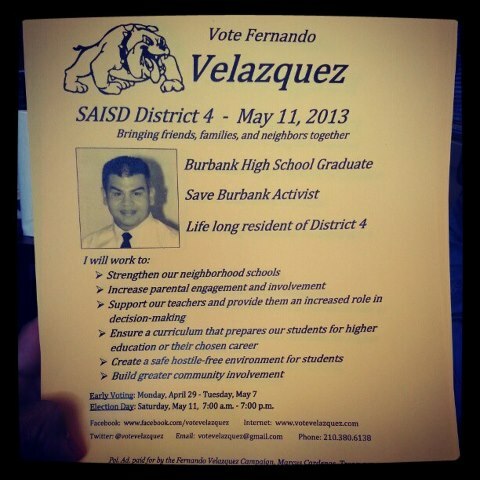 Please feel free to show up and donate your time or money to this campaign. 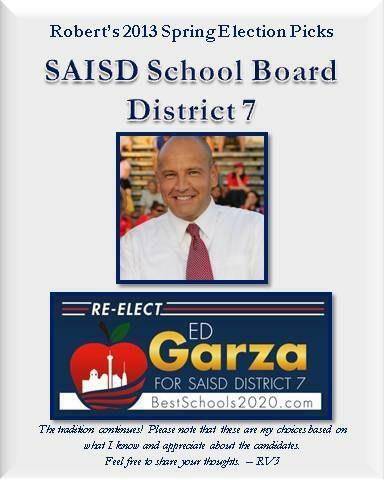 Together we can Build A Better District. time to talk about the kids.